For two years in a row, Angkor Wat in Cambodia keeps its throne as the top landmark in the world. Users of the travel review site TripAdvisor have voted and chosen Angkor Wat as the world’s #1 landmark. The pride of Siem Reap continues to reign over popular attractions such as the Taj Mahal in India, St. Peter’s Basilica in the Vatican City, and Alcatraz Island in California. Angkor Wat is a majestic temple complex that spans over 400 square kilometres. Built during the ancient Khmer Empire, it’s primarily a sacred place of worship with incredible architecture and intricate design. Many travellers to the complex arrange for a sunrise or sunset trip to catch the unbelievable scenery. According to them, it’s a “once-in-a-lifetime” experience amidst the religious ground. Angkor Wat is a year-round destination that sees two million tourists each year. Since the number is expected to rise, visitation limits are set in place to prevent “overtourism” and possible damages. In spite of that, visitors advise exploring the ruins for at least two to three days instead of just taking a day trip. 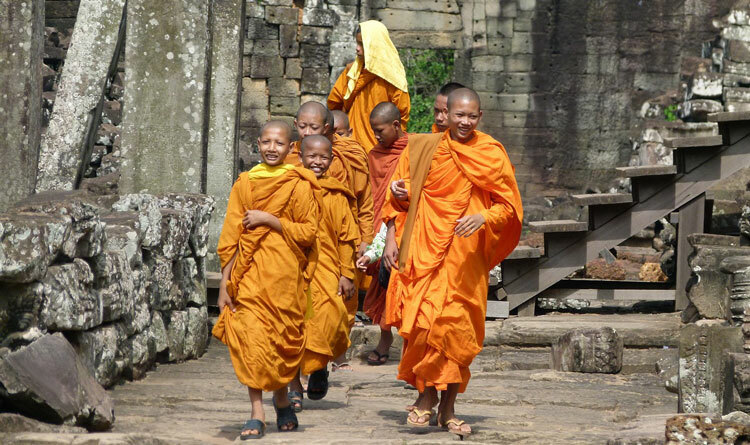 Young Buddhist monks at the Angkor Wat temple. Originally built for the Hindu god Vishnu, Angkor Wat is now a sacred place of worship for Buddhist monks. Hence, appropriate attire is essential for access. Visitors must wear long pants that cover below the knee and shirts that cover the shoulders. Those with revealing clothes will be asked to put on appropriate attire before entering the temple. 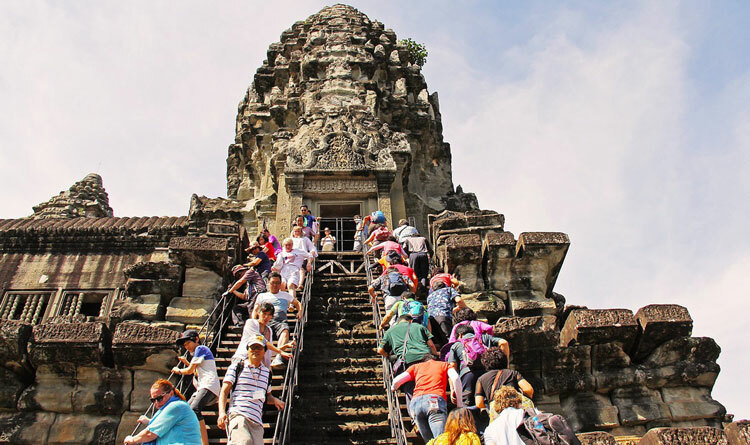 “Angkor Pass” or the admission pass to the Angkor Wat is mainly for foreign tourists. It provides access into the main temple along with other monuments within the area such as the Phnom Krom and Wat Athvea. Angkor Passes are available only at the temple site. They’re currently not sold for pre-purchases online. A steep climb up the Angkor is worth it after getting a view of the complex from above.